If you’ve got the habit of sweet iced Vietnamese coffee, and you want to help out earthquake victims in Haiti, then you don’t want to miss this. On January 30, 2010, Lee’s Sandwiches will donate the proceeds from sales of 16 and 24 ounce “Ca Phe Sua Da” to benefit the American Red Cross organization in their efforts to help Haiti in the recent earthquake disaster. Lee’s is a great San Jose success story, started as a catering truck business by Mr. Chieu Le when he’d been in the US for only a year, and now grown to over 35 stores from Northern California to Texas, as well as in Asia. Lee’s is also a great place for a light meal, because their sandwiches are inexpensive and not over-filling. The variety of other snacks (dim sum, spring rolls, desserts, …) available at Lee’s is also fantastic, almost overwhelming the first time you see it. If you haven’t tried banh mi（Vietnamese sandwiches) at Lee’s, give them a try. Visit Lee’s website for locations all around the South Bay. It means there are less than four weeks until the Cinequest Film Festival hits San Jose. This will be the 20th year of our beloved festival, and if you live in the area without ever having attended, it might be time to start venturing out of your cave. Cinequest is one of the top ten film festivals in the world, and each year filmmakers from around the globe come to our beautiful city to take part in the fun and excitement. This year the festivities running between February 23 and March 7 will include writer and filmmaking forums, a 3D Showcase, silent films from the 1920s, special visits and discussions with actor Benjamin Bratt and writer Deepak Chopra, over twenty different parties, and the premieres of 76 films from around the world. Metblogs plans to give full coverage to the festival this year and you should make every effort to participate in this yearly event. Last year Cinequest pulled out all the stops to put on the biggest, most fun festival that our city could hold, but with this year’s 20th anniversary you can be assured that founders Halfdan Hussey and Kathleen Powell will guarantee an experience you’ll never forget. You can buy a pass that will give you access to all the films and various forums and parties, depending on the level purchased. Or you can buy individual tickets ranging from $10 each, $7 for matinee, $5 student, or up to $12 for special screenings. From experience, Metblogs recommends purchasing some sort of pass which will help you avoid ticket lines the day of the desired show or will allow you to change your mind and see a different film instead. You should definitely mark off the dates on your calendar and try to attend the festival for at least one showing. Last year the films were outstanding and they are sure to be even better this year. You have the chance to meet many talented independent filmmakers and actors, and also many established, well known names, as well as see outstanding film that much of the world will never get a chance to see. Keep your eye on Metblogs for up to date information, and check out the film line-up at the Cinequest website. You can also follow Cinequest on Facebook or Twitter. The recent storms in the Bay Area caused trees throughout the city to fall, blocking traffic and causing various levels of damage. In one very tragic incident, a large city owned American elm fell on a truck on Seventh Street in San Jose with 3 occupants inside. While 2 survived, 2-year-old Mateo Ortiz died. The city claimed that proper maintenance of the tree was not performed resulting in the tree’s crown to rot since it was last inspected. When the second storm came through, half of the city owned tree in my front yard came crashing down, blocking both the sidewalk and half the street. Luckily, my own experience resulted in no damages or injuries. While I knew that I’m responsible for tree maintenance, I was surprised to learn that I was responsible for any clean-up. I was also surprised to learn I’m also responsible for any injuries and property damage. A few years ago, a large part of the same tree came crashing down on my driveway — the city performed the cleanup without charge, and when we discovered our 2 week old Saturn Vue was damaged as a result, the city sent us an insurance claim form so the damages from the tree could be repaired. Apparently, this was done as a courtesy. Now that the city strapped for cash, homeowners need to flip the bill no thanks to the Great Recession. The death of Mateo Ortiz has forced the City of San Jose to educate the public of this change — they’ve now included a link to a tree maintenance FAQ on the city’s website home page. Note that before you start trimming, you need to file for a pruning permit before you trim a street tree — it’s free. It’s also important to note that a street tree can only be removed a) if it poses a danger to the public and the City Arborist approves, or b) a request is made to remove a tree and the City Arborist has given their approval for a removal permit (which generally requires replacing the tree) plus a fee. The San Jose Mercury News is conducting a poll on who should be responsible for maintaining the trees – see the results and reader feedback. The book selection for the annual “Silicon Valley Reads” program is Michael Pollan’s In Defense of Food: An Eater’s Manifesto. Silicon Valley Reads selects a book for local readers to read and discuss every February. This year’s program begins with a live interview of author Michael Pollan by Mercury News columnist Mike Cassidy, on stage at the Campbell Heritage Theatre. This live program is on Wednesday, January 27, beginning at 7:30 pm, and admission is free. The Campbell Heritage Theatre is at 1 West Campbell Avenue, in Campbell. Additional events (see listing) are scheduled for dates throughout February and locations throughout Santa Clara County. From Pollan’s website and reviews on Amazon, I can see that In Defense of Food is an investigation into the seeming paradox that the more Americans worry about nutrition, the less healthy we become; which Pollan connects this with the increased use of packaged and highly processed foods in our diet, as compared to the more complete (due to simpler preparations) diets of our ancestors. Having just finished Pollan’s 2002 book The Botany of Desire I can expect the SVR selection to be a thoughtful analysis of its subject, making unexpected and insightful connections to history and western society. While waiting in the proverbial long line at the Meridian Ave. post office, I struck up a conversation with Jenny, the woman standing behind me. After the usual musing about long lines we got down to the business of talking about our personal lives. Women do that. We talked of children, jobs, and interests. I told her that I was a retired taxi driver and that I now had more time for reading. I let Jenny know about the last two books I had read. Both authored by Michelle Richmond, and that Michelle wrote for San Francisco Metblogs for a brief time. Which meant that I had to explain Metblogs. Then Jenny exclaimed that she too was an author! Chatting with Jenny had made the time spent in line seem almost too short. I am ordering Jenny’s book,”Loving Luke”, to read on the next rainy day. OK, so there won’t be a hurricane here in San Jose, but the big one (earthquake) could hit at anytime. There are many reasons to need emergency information. Though it is not high on the likelihood list, the threat of a terrorist attack is possible. I registered with the notification system called ALERTSCC (Santa Clara County Emergency Alert System). In the event of a catastrophe I will be notified by way of: text message, e-mail, and/or phone. After a two year absence, Spice Hut has reopened on North First Street. The South Indian fast food restaurant had been open for about a year or two when it closed abruptly two years ago. I had thought it was long gone, when I heard it had reopened at the same location as before. In fact, they’ve been back since October of last year. 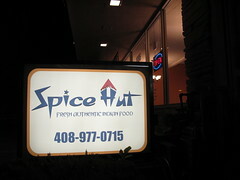 Spice Hut is part of a small chain, with other outlets in Sunnyvale and Newark. The menu has more than the typical North Indian fare most westerners are familiar with. Spice Hut serves South Indian breads like dosas and oothappams, curries, and biriyanis. A whole section of the menu is devoted to “Indian Chinese” dishes, which I’ve been too apprehensive to try. There are both vegetarian and meat dishes on the menu. My favorite are the dosas, which are giant crepe-like pancakes made from lentil flour. Spice Hut has a sada (plain) dosa; a masala dosa, where the crepe is folded over a portion of potato filling; Mysore masala dosa, with a chili paste spread over the dosa plus potato filling; and spinach masala dosa, which is like Mysore masala dosa but with spinach spread instead of chili paste. A paper menu by the register has a couple of extra options that aren’t on the menu on the wall. The portions for curries are very generous, enough to take home leftovers for the next day. Dosas, on the other hand, come with sambal (brothy soup) and two sauces, and make an excellent light dinner. Prices are very affordable. Spice Hut is located at 1086 North First Street in San Jose, and is open Monday – Saturday, 11:30 am to 9:30 pm.